Anyway, now you're up to speed, you can see why I'm happy to have reached the finish line can't you? Nothing more satisfying to tick off the wip list than a big beast of a project that's taken it's time to complete. This was, apart from it's slow development, a joy of a blanket to work on. I started it by using up quite a few oddments of leftover yarn and that's always satisfying. Although it did lead, inevitably, to further purchases as colours ran out. I didn't agonise too much over the subtleties of shade difference though, mostly because there would have been no blanket if I had, as some old colours had long since bitten the dust. But my new choices were close enough to not affect the overall tone and feel of the thing and that was all that mattered. I think that's half the reason I enjoyed making this one so much, because these colours are so heart-liftingly, happy making. Even at the end of the project, when every conceivable combination has been tried and rejected or enjoyed, I didn't tire of these colours together. A rare tribute indeed. I'd like to think that it's a sign of my increasing maturity, or possibly my increasing fickleness, that as I was on the home straight with the end in sight I suddenly decided to add a tricky little edging to the border. Something that meant extra rounds, extra yarn and extra work. 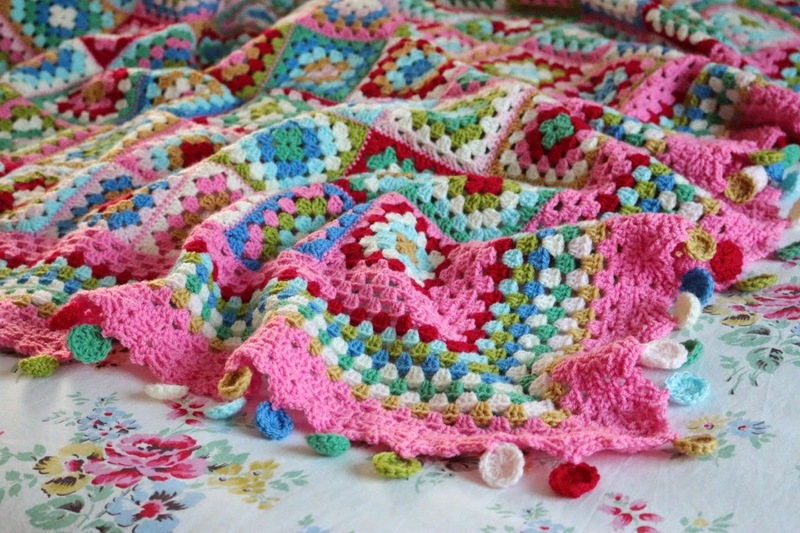 I like those little pom-pom edges that people are adding to their blankets these days you see and I wanted to do something similar. I don't know if it's just me and my inadequate skills in this area, but pom-poms don't seem to be the sturdiest of creations. A cat's paw here, a child's fiddling fingers there and you are liable to end up with scattered yarn strands on the floor, a deflated pompom and guilty looks. So, to get a similar effect but without the risk of ending up with bedraggled ex pom-poms littering the place, I decided to substitute little crochet circles instead. Thus saving myself a lot of work and potential disappointment later. It's not quite as gorgeous and wonderful as the full 'pom' experience perhaps but I know this 'safety first' approach is the right one for me. Well, there you have it. I hope looking at it will give you some of the pleasure that it has been giving me. I'm loving having it around so much at the moment that I might poach the thing and squirrel it away into my 'new and improved' craft room. Selfish of me maybe, but on reflection, I've decided I'm worth it! 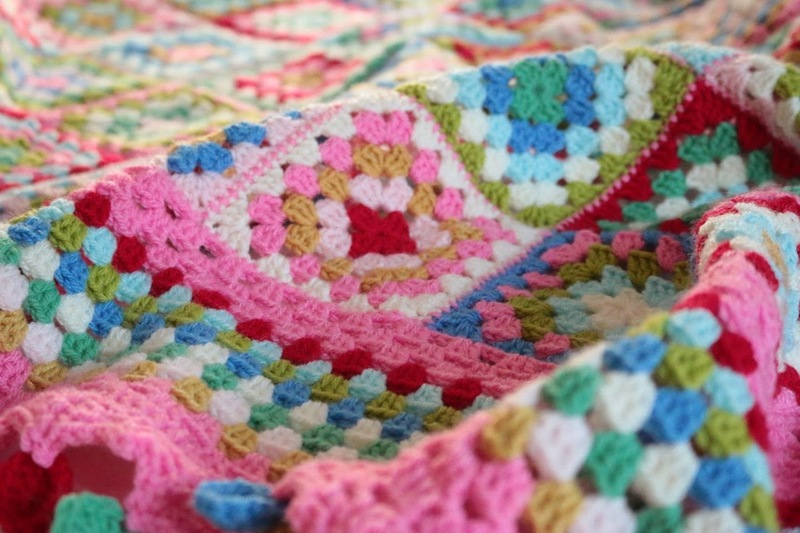 I love the fresh and cheeful colours of your latest blanket. All your hard work was well worth the effort and the end result is just lovely! It's gorgeous Sandra. 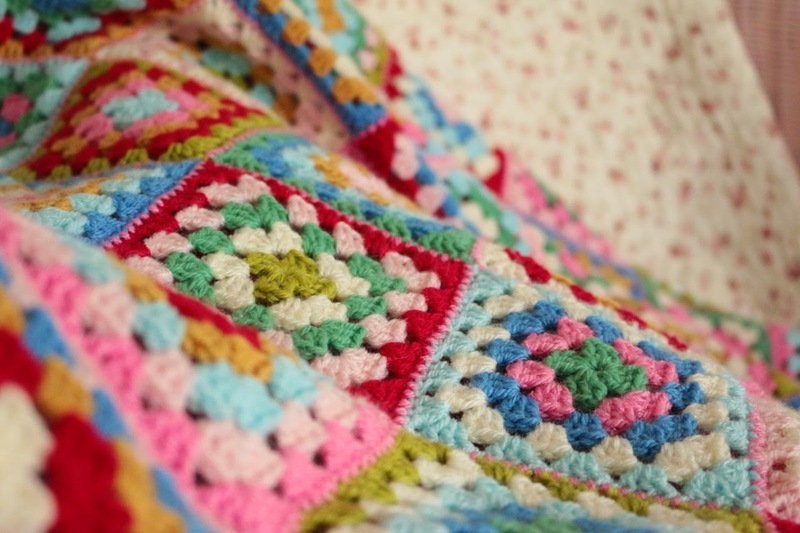 I think Granny Square Blankets are my all time favourite, and the colours and edging just make this really awesome. I hope you get many snuggled underneath it! Wow, just wow, it's gorgeous Sandra, I adore the colours, and the circles are genius, a lovely twist on the current pompom trend! That's the jolliest, happiest, nicest blanket I've seen in a long time. I'm humming a tune here merely due to looking at images of it. I hope it brings you much good cheer! 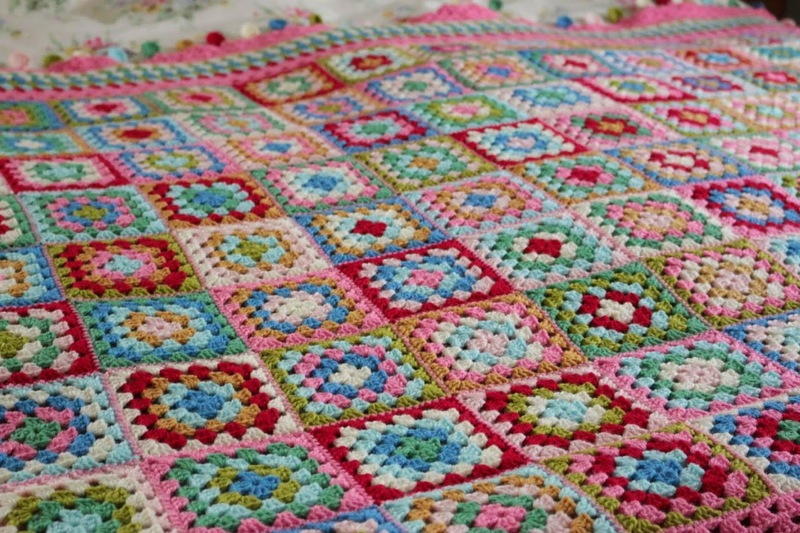 This is such a pretty blanket, I love it! What a very beautiful blanket. Love the colours and the finishing circles!!! Gorgeous!! Love the bright colors! I'm not a fan of pompoms, but the circles are perfect! Absolutely amazing and beautiful, Sandra. Perfect for the dark days of winter, to cheer up your home! It is truly stunning! I just love these colors. I love your blankets. And the edging here is magnificent !!!!!!!!!!!!!!! 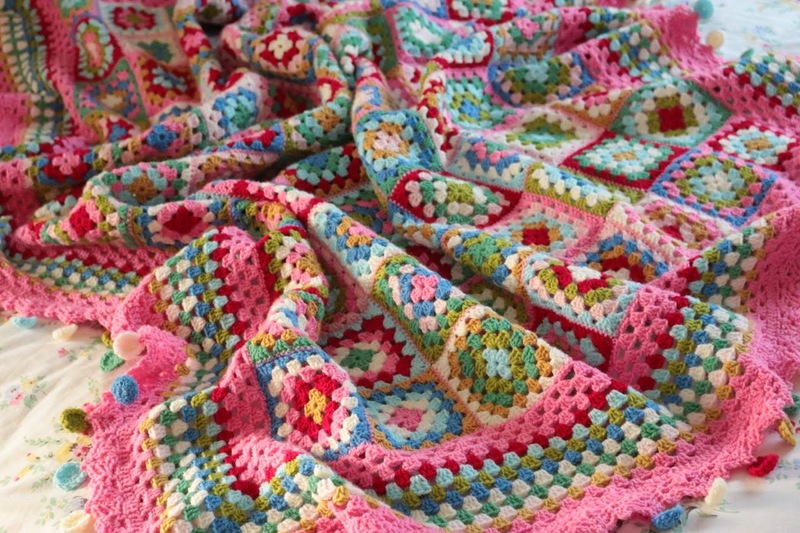 A very cheerful blanket:) I normally go for blues and greens because they are my favourite colours, but I kinda like your choice as well. It looks pretty nice. Such a good name for your blanket, it looks so colourul and cosy. Oh yes!!!! a really happy blanket!!!! 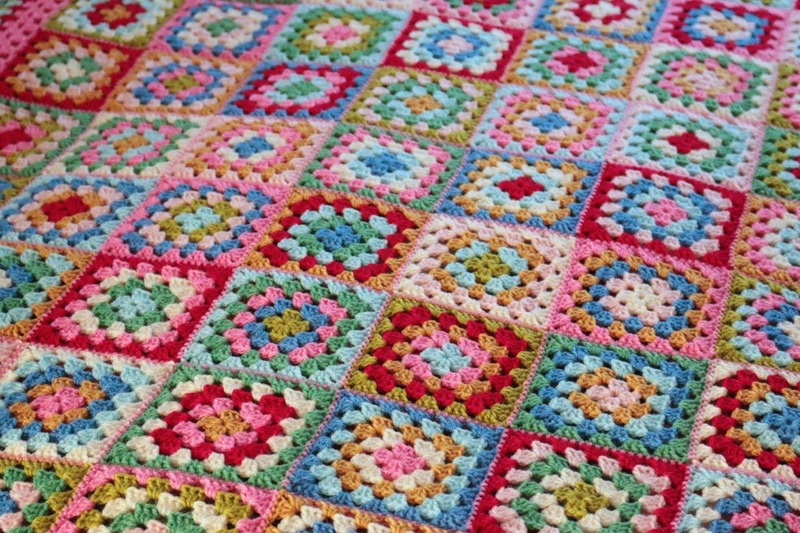 This has made me smile Sandra, it such a happy and cheery blanket with great colours. Brilliant!! This is a splendid blanket. Love it. Wow! Eye candy indeed. You are right the colours are light and bright again no wonder you did not tire if them. Love your circle Pom Pom idea. It works really well. OH MY!! IT IS SOOO PRETTY! I love the colors. 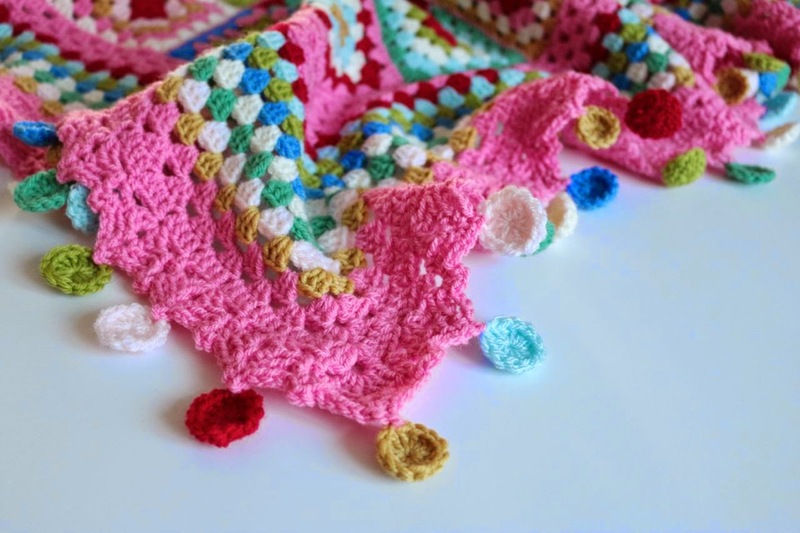 I have the same issue with pom poms, and I adore your much-sturdier border. Awesome job. Yep, that's proper eye candy, in real candy colours with sweeties round the edge. I think it would be rude to put it anywhere other than your craft room. Love these colours - so pretty. Muchas gracias. Es una manta preciosa. Beyond delightful! And I just love the faux poms. So, so cute. I'm working on my first granny blanket - a lapghan, really - and have a new appreciation for the amount of time they take. Oh, the ends to weave in! You are sooooo talented! I love all your designs. Those colors are so pretty together and I don't blame you one bit for snatching it for yourself. I would do the same! Thank you for sharing the finished product with all your fans! Humm, you’ve got me there with the soft sage green… maybe this one from Debbie Bliss? Lovely colour but a bit pricey if you are planning a blanket. Also it’s not one I’ve used so I don’t know how the colours looks in RL. Hopefully someone else has some ideas! Dear Sandra, I have been looking at this afghan every day since you posted. It is absolutely lovely and the colors are scrumptious! I have to make one as soon as I a have completed all my holiday works in progress. So far, this season, I have completed two of your Christmas tree skirts. The pattern was fantastic and they look just as nice as yours. I matched one to the colors you chose and then did a second one in pastels. I can't tell which one I like most. Tell me, please, is the Stylecraft Special DK truly a soft yarn. I have been wanting to try it and I am now finding suppliers here in the U.S.
Really nice! The colors are perfect. I love the little circley things you added instead of pompoms. I think they are much more charming and practical than pompoms. 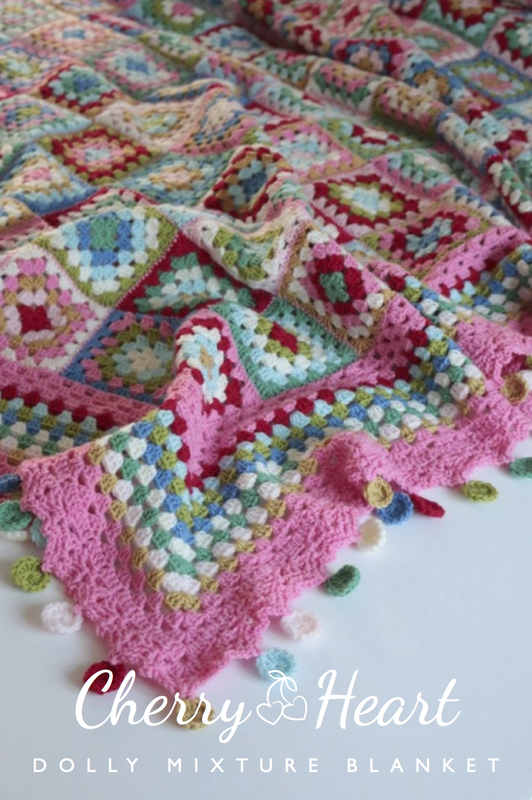 Thats just beautiful and i love the circle edging-i have just finished a large granny square afghan and have just done a very plain edging but now im thinking i may well add circles to the second row using colours from the blanket.